When the holidays come around, you just have to do some sort of spiced cake or cookie. It has never been a tradition to make Christmas sweets in my family, but we always loved consuming them. Christmas in the United States meant eggnog and gingerbread houses; in Kerala there were plum cakes and fruit cakes that would last us well into the new year. This year, of course, since I wanted to be SuperMom, I decided it was time to start my own Christmas baking tradition. So what if my son doesn’t have teeth yet? He can still see the pictures later. 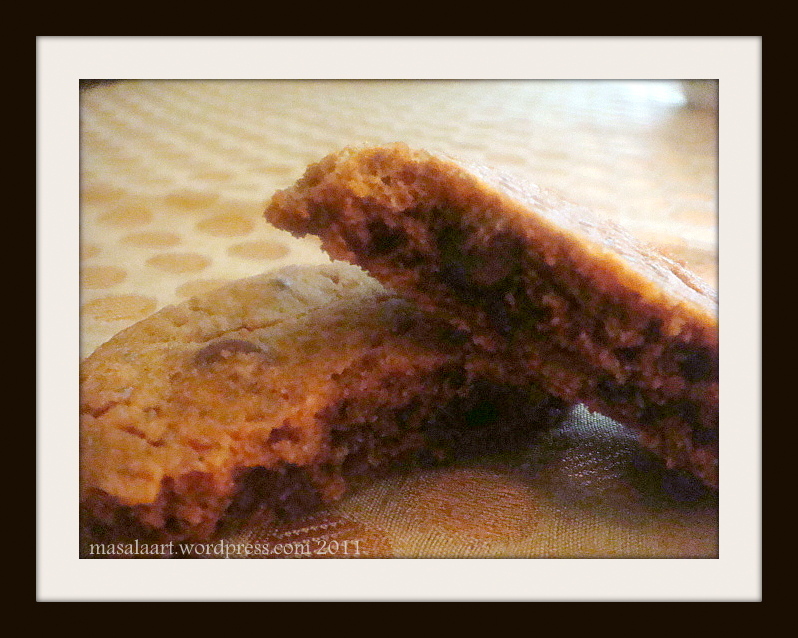 I didn’t want to make gingerbread, nor did I have the patience to make plum cake, so I decided to settle for a spiced cookie. 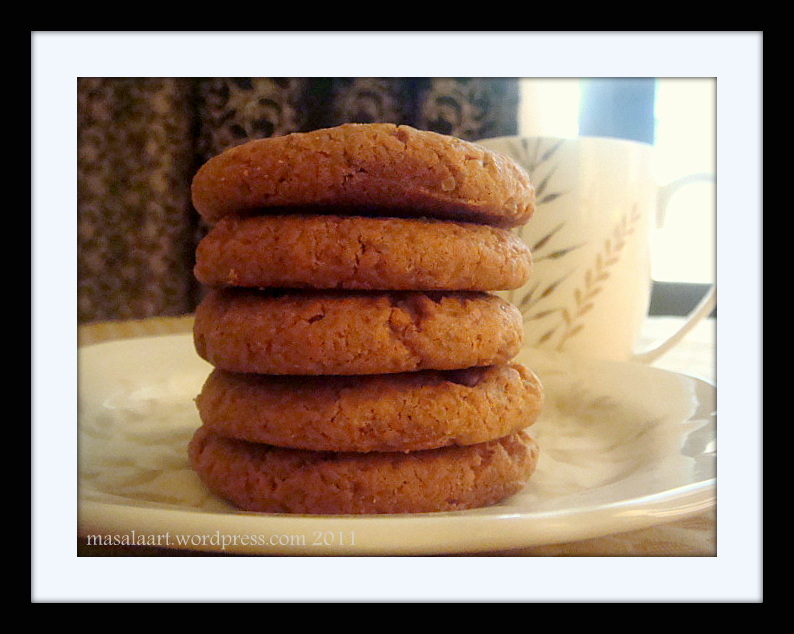 I wanted something with hints of cinnamon and sugar, and I when I was searching for spiced cookie recipes, I found a simple and inviting one on Joy The Baker. The recipe was for brown sugar cookies. I adapted it and added a touch more spice and chocolate chips. And you know what? They turned out pretty darn good! Visually, my cookies could have been pressed down a little bit more and made a little less slimmer so that it looked a little more appealing when stacked. (Too much use of the word little. I did not plan that.) But once I began eating them, I realized that when you encounter skinny cookies in the market everyday, it’s nice to have an old-fashioned, family sized cookie that covers the palm of your hand. In a medium bowl whisk together flour, baking soda, cinnamon, and ginger. Set aside. Place butter and demerara sugar in a large bowl. Beat on medium speed until light and fluffy, about 4 to 5 minutes. Stop the mixer, scrape mixture down the sides of the bowl. Add the egg and vanilla extract, and beat on medium speed for a minute longer. Add the dry ingredients, all at once, to the butter-sugar mixture. Beat on low speed until the flour begins to disappear and the dough forms. Stop the mixer, add the chocolate chips and combine all the ingredients with a spatula and knead with your hands to bring it together. Once all the flour is thoroughly mixed in, cover the bowl with plastic wrap and refrigerate for 30 minutes. 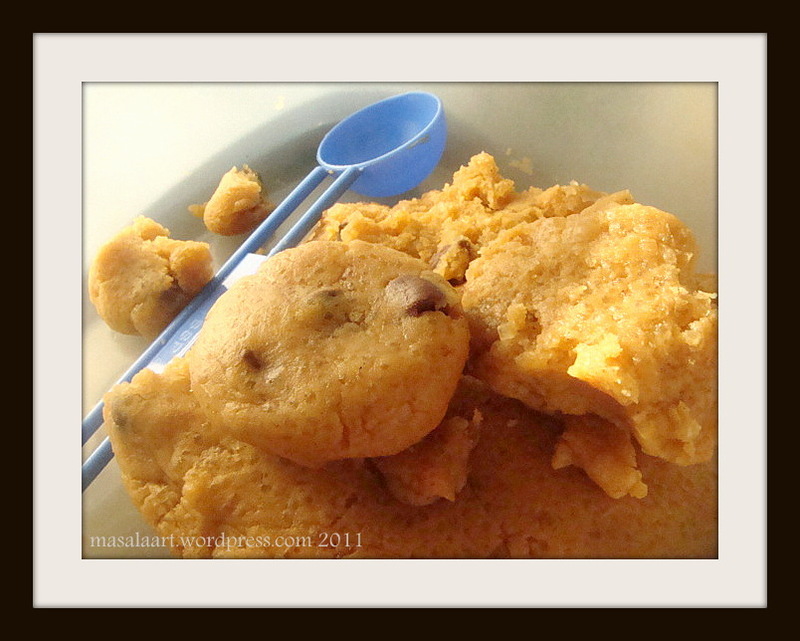 Preheat oven to 240 C. Dollop tablespoon-sized balls of dough onto the baking tray and press down into a cookie shape.